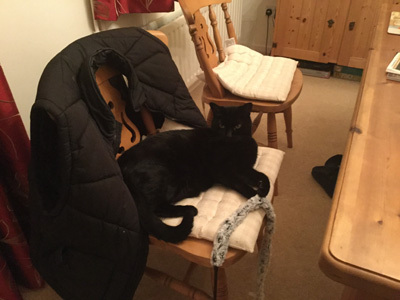 "Please find attached some pictures of Behemoth which show him settling in to his new home. He loves the open fire and I took this earlier in the week so you can see his coat is lovely and shiny. We've still got the blanket he came with and although he slept on it the first couple of nights he is now sleeping all round the house. The landing is his current favourite. We're trying to give him some exercise and he loves killing his toy, as you can see in the second picture. He is full of energy and we are planning to let him out this weekend, under supervision. He's desperate to get out and sits in the window watching birds. 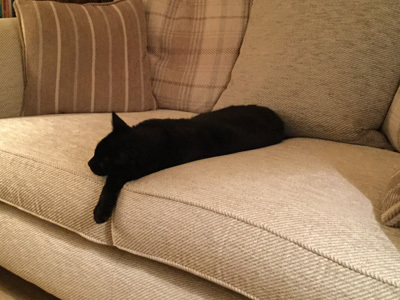 The final picture shows him relaxed on the sofa. He generally doesn't get on the sofa without one of us to snuggle up with. He does enjoy bouncing round our bed early in the morning, often starting to shout about 4am. We need to learn how fit he is compared to our last cat. I caught him on the kitchen worktop earlier in the week licking some frozen chicken drumsticks. Chicken lolly anyone? Behemoth is delightful and was clearly a much loved pet before he came to us. He has a very gentle nature and is very confident. He is settling in well and is getting us trained up to meet his needs." 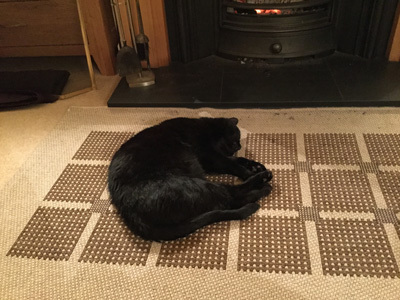 A lovely update - we are so pleased that he has settled in with his new family so well!